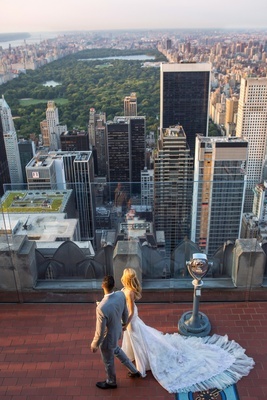 Having met, fallen in love, and gotten engaged in New York City, the couple found the town to be the obvious choice for their wedding. 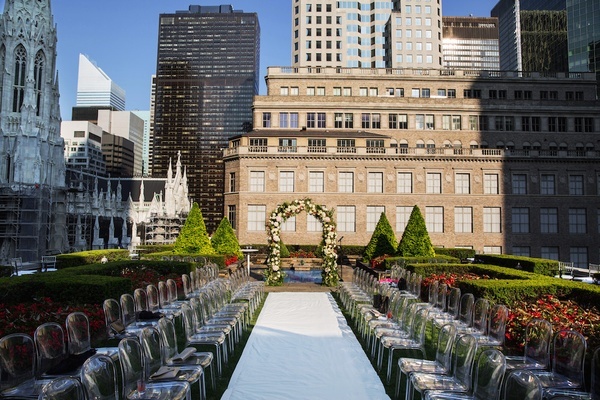 “The location was at Rockefeller Center on a rooftop overlooking a beautiful Gothic cathedral amongst the surrounding buildings,” Landry describes. Guest seating – sculpted ghost chairs – was arranged on two levels to face the aisle, which led to an elegant floral arch overlooking a stone fountain. 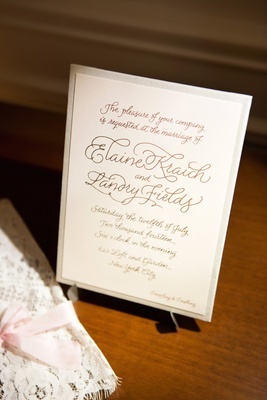 Attired to coordinate with the bride’s blushing color scheme, eight beautiful ’maids preceded Elaine to the altar to the sounds of a string trio playing “Flightless Bird, American Mouth” by Iron & Wine. A very special ring bearer trailed the last of the attendants. 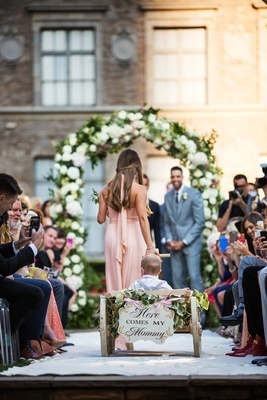 “My son coming down the aisle in a wagon because he wasn’t able to walk just yet is one of my favorite memories,” Landry recalls. “I didn’t think I was going to cry at my wedding, but seeing that, I lost it.” Elaine followed to the strains of Leonard Cohen’s “Hallelujah,” and carried a lovely cascading bouquet of pale pink and cream blooms with stems enveloped in a handmade, beaded wrap. Following the Christian vow exchange officiated by the couple’s pastor, guests gathered on an indoor/outdoor patio area for the reception. 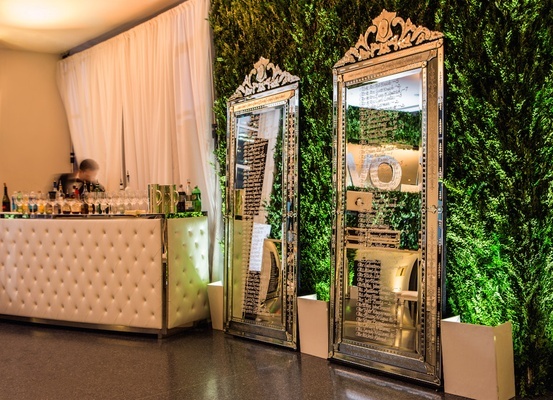 Two ornately framed mirrors were etched with seating assignments for tables beautifully set to the bride’s specifications. 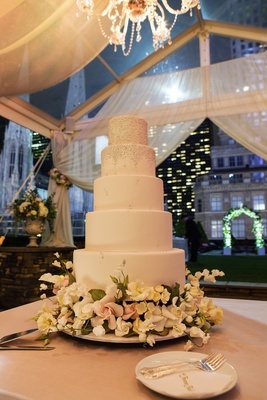 “The flowers included ivory lisianthus blossoms, cream roses, barely blush spray roses, [vanilla] hydrangeas, white phlox, mauve roses, and [pink] hydrangeas, all mixed in a collection of etched- and cut-crystal vases of varying heights and sizes,” Elaine describes. 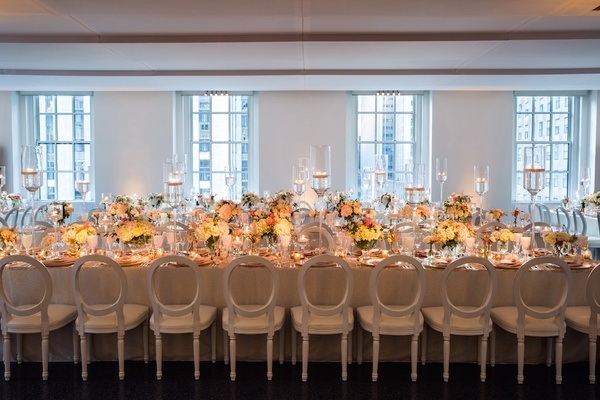 “Glass candle stands up to three feet were lined down the center, and a mix of rose-gold and mercury-glass tea lights were sprinkled throughout.” Neutral dining chairs beautifully complemented muted table linens that featured a pale gold pattern in velvet. 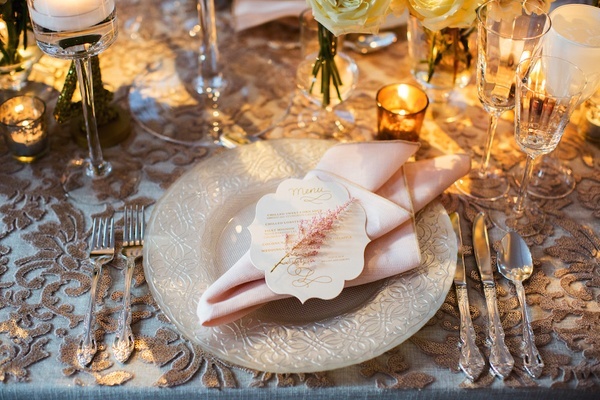 Blush napkins topped with die-cut menus completed the elegant scene. 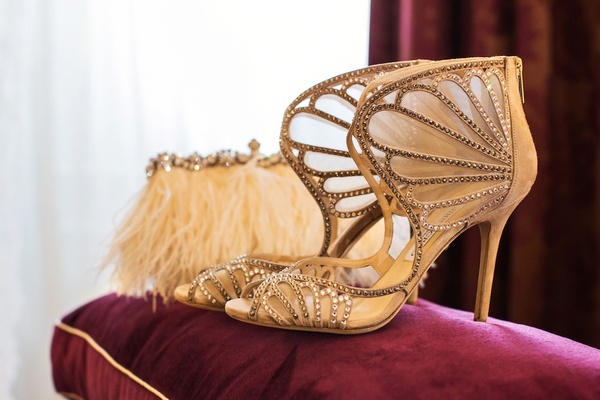 “I wanted the feel to be romantic – glamorous but not pretentious, classy but not stuffy,” says the bride, who slipped into a reception dress before joining her freshly minted groom for a spin around the dance floor to “This Year’s Love” by David Gray. 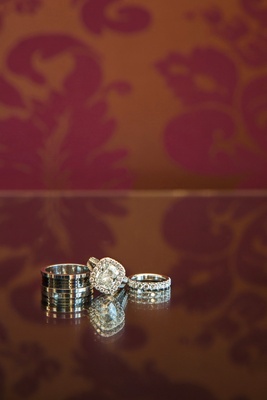 The couple’s dance was all the impetus loved ones needed to take to the floor themselves. 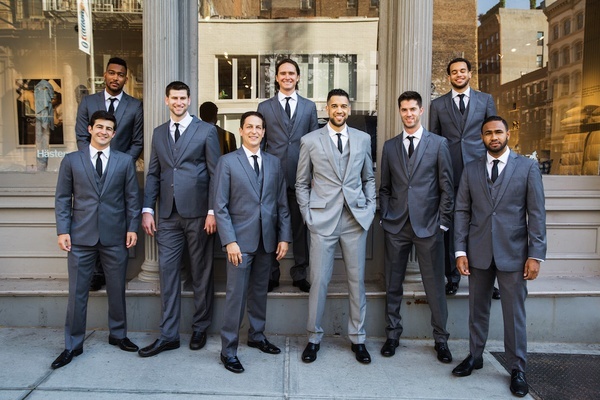 “We had a great sized area for dancing and really just danced the night away to a combination of all kinds of music, but we definitely made sure to honor the music that brought us together in the first place,” Landry shares. “Ever since that concert, EDM turned into my favorite genre!” It was a lesson in music that was beautifully learned.